FROM BUILDING CARRIAGES FOR ROYALTY FOR A CENTURY TO A VICTORIAN WORKHOUSE: WHAT HAPPENED TO CAROLINE HOUSE? Roman legionnaires must have marched along the London Road. Later, one of the most impressive events in the road in the 16th century must have been the royal progress of Queen Elizabeth I along the London Road when she included Bath in a visit to the South West (Source: Bath Chronicle 24/10/89) but the buildings of Longacre deserve a special place in History in their own right. And yes it also deserves a capital H! Just to explain, on the location sandwiched between the bottom of Thomas Street and the Longacre Tavern stands the Longacre; a row of Georgian and Victorian buildings consisting of Nos 1 & 2 Longacre, where Caroline House is now and which used also to be called Longacre Hall. Then comes Nos 3 & 4 (the building which as proposed by Somer Housing will become a hostel). It started in the 18th century when the premises were built and we can only wonder why Somer Housing and the local authority want to obliterate this part of Bath History. These photographs speak for themselves but as you can see, the Vezey & Co advertisement of 1906 says 'By appointment to the Late Queen Victoria'. The Royal Mews houses the State vehicles, used for coronations, State Visits, royal weddings, the State Opening of Parliament and official engagements and we are investigating with the Palace Museum examples of Vezey & Co works, built at Longacre used by royalty in the UK and abroad. “No 2 [now Caroline House] was the workshops of Messrs Vesey & Co, Coach Builders and Harness Makers; No 3 was the residence of the proprietor. They were coach makers to her Majesty Queen Victoria and to the King of Sweden. The coming of the motor car led to a decline in coach building and after 100 years in the same premises the firm closed in 1908.” Source: Walcot Parish: Walcot Townswomen Guild. Further records show even more interesting information about a royal connection. - They received the medal with honorable mention at the Great Exhibition of 1851 for a newly designed Sociable (see photograph; a bicycle that supports two riders who sit side by side) of that date, which was afterwards sold and sent to India. - They also received honourable mention at the International Exhibition of 1862 and were awarded a gold medal for their Victorias at the Calcutta International Exhibition 1883-84. (Source: Ports of the Bristol Channel (1893)). - According to the edition of the Ports of the Bristol Channel of 1893, one of the Vezey & Co coach scale models was a magnificent State coach made initially in 1761 for Queen Charlotte who approved personally its design. The State coach was built by Mr. Butler, coachbuilder, of Great Queen Street, London from designs by Sir William Chambers and decorated with carvings by Wilton, and paintings by Cipriani. The drawings from the Royal Collection gives an idea of the magnificence of this coach. The State coach was first used for the wedding of Queen Charlotte in 1762 to George III, then later used at Queen Victoria’s coronation in 1837, and those occasions when the Queen Victoria conducted the state opening of Parliament, up to the time of the Prince Consort’s death. (Source: Ports of the Bristol Channel (1893). - Also in 1817 when Queen Charlotte stayed in Bath, a year before her death, she included the showrooms of Vezey & Co in her visit. The State carriage was also sent to the Fine Arts Exhibition at Manchester, and to the London Exhibition of 1862. It was subsequently exhibited at South Kensington Museum, and the council of the Society of Arts requested the loan of it to send to the Paris Exhibition” of 1889. Thanks to British and foreign royalty, nobility and others wealthy customers, the large workshops “situated in Long Acre, Bath, give employment to a large number of highly skilled workmen and are splendidly equipped with the most effective appliances” (Ports of the Bristol Channel (1893). The whole of the five storeys at Longacre Hall (or Caroline House) was used by various community groups and a Youth Training Project. In 1985 the garden at the back of the Longacre Hall which was first set up as a community garden. Walcot & Snow Hill residents are still very found of the visit of Floella Benjamin, OBE (www.floellabenjamin.com) to open this play garden. Newspapers describe this garden as “children’s paradise” and many parents and now grown up children remember it as such. Sadly this public play area was closed without notice or consultation in the late 1990’s. It has remained inaccessible since and now, Somer proposes to put a three story building of doubtful design on this very location, which will mean the disappearance for ever of a valuable green space. Why such a thing when this green space has become vital to fight pollution (the London Road is recorded as the third most polluted thoroughfare in the UK - DEFRA data)? Though it was really such a useful resource for the adults and kept many children happy, the crèche at Longacre Hall sadly closed down as well in the late 1990’s when the local authority decided to stop supporting the community centre. Also as you can see on the photographs before Somer (Bath Self Help) ultimately took on the whole building of Caroline House, a photographic gallery (F.Stop) was based on the site before moving to Green Park. Its studios offered workshops for beginners and professional photographers alike. Contemporary artists worked there. Click HERE for another example. Equally Caroline House aka Longacre Hall offered a great venue for music and concerts on the first 1st Floor. Local musician, Peter the Potter held classes for children, among others musician performance. Finally on the 2nd and 3rd Floor, carpentry workshops offered children and young adults, the opportunity to develop useful skills to help find employment. More recently the FOTEC Centre on the ground floor, provided community service for unemployed and young people. It offered classes in basic reading and writing skills, IT skills training to help people to adjust in an ever changing working environment but, again under funding has meant almost non existent activities nowdays. In 1935, No 3 Longacre was bought by a widow, Mrs Nellie Kemp, and she established a café and bed and breakfast accommodation. It was called Jubilee Café to mark the Silver Jubilee of King George V. With the war came rationing and the premises suffered a good deal of blast damage in the raids on Bath. In 1943, the premises were sold to a Mr. and Mrs. Kite who continued the business. Mrs. Kite gave up the business in 1957 though the premises continued as a café for another 10 years (1967). Source: Walcot Parish: Walcot Townswomen Guild. Later a printing shop used the premises, it then became a second hand antique shop. No 4, the next building along, before the alleyway, was a private house until it was leased to the West Indian Community. 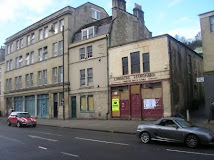 There is still a debate on the ownership of this particular building and as to why the local authority has left these properties to become derelict over many years despite several offers made to the Council by local businessmen to purchase No 4 to be used as a shop, and particularly when the area is clearly marked as a designated shopping area in the Bath Local Plan. Then across the alleyway lies the Longacre Tavern, a contemporary dated building as per the photograph below. However the Long Acre Tavern also has a special place in the history of brewing in Bath but 1956 marked the closure of its brewery and finally the end of brewing activity in the city, a craft which almost certainly predated the Roman settlement and was one of the city’s main industries in the eighteenth and nineteenth centuries, was no more. Sources: Bath Chronicle 14/01/1956 and Bath Pubs (by Kirsten Elliott & Andrew Swift). As you can see on the photographs the original Georgian building was demolished in the 1960’s and was rebuilt to a typical 60’s design, definitely another very fine example of the post war sack of Bath! Let’s hope that Somer and B&NES council will not continue to pursue their current plans in that sad tradition… but the design of the current extension behind No 2 to No 4 Longacre is far from encouraging. Sadly the below photo illustrates what is now left of a site full of History and of a community centre that provided so much to the wider community for many years. On 17 June 2008, Cllr Colin Darracott, Liberal Democrat and member of the Bath Planning Committee confirmed that B&NES Council is under an obligation to get best value for money when disposing of public owned properties with the exception of affordable housing or properties that may be of value to the community. We acknowledge the needs for change but with a past that has enriched the whole community, can Somer plans really be what the Council wishes for the future of Longacre and Bath heritage? And what are the reasons for B&NES Council to have left Longacre to fall apart for so long when the London Road is the main gateway to the city. The absence of community infrastructures is evident in the area and the London Road is in need of much more care and attention? Is it not time for B&NES to finally make a positive and visible statement for the London Road and Snow Hill area at Longacre instead of creating, as what many call it, a Victorian Workhouse. Click HERE for more information. The whole community, residents and businesses alike, of the London Road would like to remind B&NES Councillors, decisions makers and planners to think again when Somer logs its planning application this summer and look into the potential that these premises could do for Bath and its community. We thank every one who contribute to this article, especially the Museum of Bath at Work which gave us access to necessary information to piece this bit of History together. All ideas and proposals for the sustainable redevelopment of Longacre are welcome. Please contact us at ilovethelondonroad@gmail.com if you wish to comment or contribute. Four weeks after promising new architectural drawings, we are still awaiting any communication from Somer… This despite many reassurances by Somer themselves and the local authority that the London Road community will be listened to! On 17 June, Somer representative, John Glyn announced that revised plans would be presented under one week and accessible on the internet. Is it therefore too much to ask Somer Housing and their architects, GCP Chartered Architects Ltd,to keep their promises and show us any changes made to this very disputable project? Or was the public meeting just a pure PR exercise for Somer? As confirmed by Cllr Vic Pritchard, main proponent of the scheme, Somer is to seek planning consent by the end of August or sooner if possible. Once again this situation only serves to confirm residents and business' worst suspicions of the purpose of this pseudo consultation. ISN'T GREEN PARK HOUSE SUITABLE? It is confirmed that B&NES owned hostel, in Green Park in Central Bath, which was closed and put on the market, last year, in fact remains unsold and could therefore be renovated at far less cost than the proposed new building at Caroline House/Longacre on the London Rd. We note that this large council owned hostel, known as Green Park House, was constructed about fifty years ago; it is very substantial and purpose built and constructed of local Bath stone. It contained until its recent closure, a supervised hostel for the adult vulnerable and supervised residential accommodation for the elderly as well as mixed social housing. We wonder why at the public meeting on 17th June when asked what alternatives exist to the site at Caroline House/Longacre, Cllr Colin Darracott, chairman of the meeting and member of the Bath Planning Committee said “there are no sites in Bath and that the only other solution would be for the hostel to be built outside the town”? Click HERE to hear it (Part 11 of the audio recording). Why, therefore, is B&NES Council still willing to dispose of a very suitable and essential public owned asset at Green Park to build a similar one in another part of the city? At what cost for the tax payer and why on the London Road at a location that is unanimously considered completely unsuitable to ensure the safety of future residents? Is B&NES planning to offset money received from the sale of the buildings at Green Park for the London Road community? Clearly this is not the case. The local police force has confirmed that no contingency plans have been drawn up to deal with a larger facility for the homeless. The Police admit that "the more people you fit in, the more problems you get. This leads to delays in response time and subsequent difficulties". Click HERE to hear it (Part 9 of the audio recording). Members of the public have asked if there is any logic in the sale of the Green Park hostel. A comment from a resident echoes this: “I have contributed with my council tax for this hostel [Green Park] and for council tenant use. Why is it then, that B&NES and central government via tax payer’s money will now be subsidising Somer when they build a replacement hostel at Caroline House & Longacre?” Click HERE to hear it (Part 5 of the audio recording). There will probably be no adequate explanation for the closure and sale of the Green Park House… Maybe this is the beginning of the answer: its closure and sale, with outline planning permission for demolition and re-development for commercial or corporate purposes have been included in the so called “Future for Bath”, an ambitious speculative commercial development proposal... To know more click HERE. In this context aren’t people right to question the drive and motivation of B&NES Council current policy on social housing, including the disappearance of viable social housing stock, as it is happening at Green Park? Stop SOMER Housing: sign the petition now! Click HERE to sign and persuade SOMER that building sheltered housing at 3 & 4 Longacre is not a good idea (The online petition is hosted on the Liberal Democrats Website). Want to know more about traffic information and congestion issues in Bath? Click HERE . The CO2Efficient Company, managing carbon for a sustainable future. PACT (Partners and Communities Together) Meetings give you a chance to have your say about your area and influence priorities in your neighbourhood to make it safer and stronger. Reconstruct, providing training, consultancy and children's services to the social care sector in the UK. This blog is for the community of the London Road in Bath. It is created by local residents who are trying hard to promote a sense of place and well being in this area of Bath. It intends to defend the interest of its community and to help to bring a vision to the London Road.